It’s just a matter of time before somebody involved in mapping the human genome discovers that strand of DNA responsible for male-pattern-transportation-fixation (MPTF). I was ten years old when that latent gene first expressed itself in my life. To this day, my boy heart beats just a little bit faster as I recall it. At my ten-year-old birthday party, I was instructed to close my eyes. When they opened, I beheld the third best gift I have ever received in my 50-plus years of life: (#1) at 34 years old…my wife; (#2 a,b,c) at 36, 38, and 42 years old…my three kids; (#3) at ten years old…A TRICKED OUT STINGRAY! There really aren’t words to describe what occurs in a little boy’s bosom when a brand new, 1970’s Schwinn Stingray is wheeled into a birthday party. Breathtaking! The banana seat with subtle sparkles built into it glistened as the bike titled this way and that. 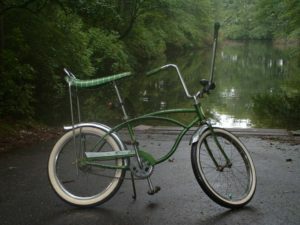 The deep “u” shape of the butterfly handlebars reeked of a kind of Harley Davidson/James Dean form of outlaw masculinity. Was it my imagination, or did I hear a kind of distinctive manual-type-writer “ding” as an asterisk of light sparkled off of the chrome of the mud protector? Here, in this miracle of craftsmanship, I knew that Marilynn Monroe’s restless spirit had found a suitable vessel. Reincarnated into mechanical form, with that enticing smile, once more I could hear her crooning, “Happy Birthday Mr. President!” And on one sparkling, special day of my life, I was the President! I could feel the confetti falling all around me. Sweet Mother of Josephus, all I wanted to do was tear down the street and proclaim to all who would listen that I was in love with the most beautiful girl in the world! Over countless ramps I flew slow-motion, Evel Knievel style. Past dozens of snarling, barking, leash-free dogs I peddled for my life. On my beloved steed, I logged who knows how many sticky summer country miles? We were inseparable. She was the Bonnie to my Clyde, the Trigger to my Lone Ranger until that fateful crisp, Fall afternoon of my freshman year. It was then that Dan Jarrio and Mike Hemminghaus showed up with their large-wheeled ten speeds. Together, we had scheduled a bike ride from Dan’s suburban house, to my rural home in the country many miles away. On that fateful day, I learned one of the immutable laws of nature: things have a way of changing. On one sunny, blue-skied day, I discovered that even my little mechanical Marilyn Monroe was not immune from this cruel law of nature. From almost the first pedal stroke, I discovered that I was having trouble keeping up. Each push on one of their pedals sent their larger, geared-up wheels at least three times the distance, and saved them three times the energy as my “made-for-a-ten-year-old” bicycle. It was as if my bike was a poetic old MG competing against a prosaic, but more muscular Crown Victoria. Within an hour, I was gassed. That would be the last bike ride I would take during my high school years. Just like boys and girls have a way of outgrowing their childhood bicycles, from time-to-time, other dimensions of our lives also need updating. This Sunday inaugurates another season of grace for people from the Christian tradition. Advent is meant to provide sacred space for evaluating the vehicles of our spiritual lives. 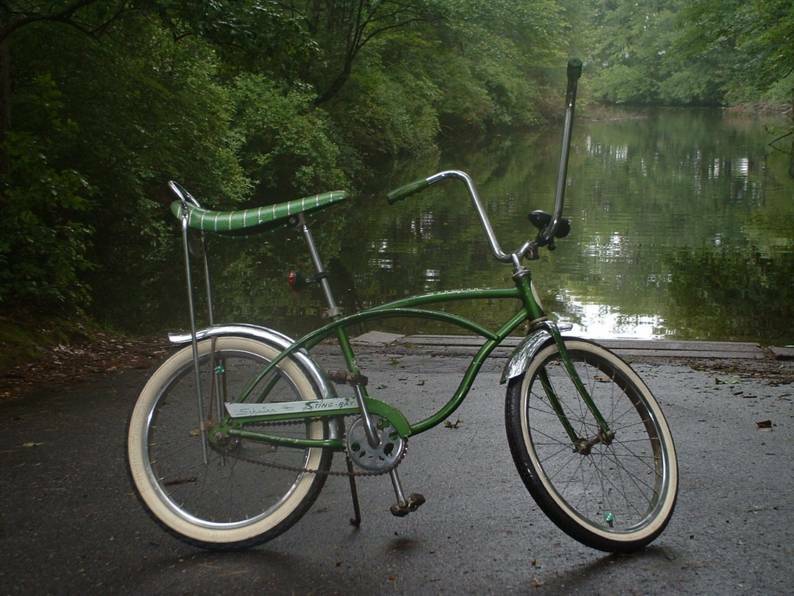 Many of us are still riding around on the old childhood models of faith that we have been pedaling since eighth grade. The problem with ignoring this need to update is that an outdated, childish (as opposed to “childlike”) form of spirituality can’t always get us where we need to go as adults. An unintended consequence of a failure to upgrade our spiritual lives is that our faith can become like a quaint/beloved old bike that we pack away in moth-balls. We don’t use it for anything significant anymore, but it is too sacred to throw away. We may visit it, and look at it from time-to-time (even weekly), but unconsciously we know that its fragile framework can no longer carry us. Failure to invest in more mature forms of spirituality can make something as meaningful as the liturgical season of Advent nothing more than a nostalgic effort to recapture a familiar old Christmas feeling. This Advent, what are you willing to do to upgrade your vehicles of spirituality and faith into forms more worthy of your adult mind and heart? For example, when was the last time you read a book about spirituality that put you on your intellectual toes and broadened your vision (eg. Surprised by Joy, or The Great Divorceby C.S. Lewis)? Have you read a good, solid spiritual book lately (Jesus Calling,by Sarah Young; Open Mind, Open Heart, by Thomas Keating; Seven Story Mountain, by Thomas Merton)? Do you have a daily podcast that enables you to reflect more deeply (e.g. Pray as You Go; Sacred Space)? Who is your favorite spiritual poet (eg. Rainer Maria Rilke; Gerard Manley Hopkins)? Have you attended a preached, or directed retreat in the last several years? Type any of the local retreat centers’ names into your search engine. You could be well on your way to an Advent spiritual upgrade (“Mercy Retreat Center,” “Jesuit Retreat Center,” “Marianist Retreat Center,” “Franciscan Retreat Center,” “Trappist Retreats,” “Benedictine Retreats, “Contemplative Outreach,” “AA Retreats,” etc…). When was the last time you sampled something new from the smorgasbord of spirituality (eg. Centering Prayer, Lectio Divina, Mindfullness Exercises, Sacred Music, Memorization of Psalms, Daily Office, Eucharistic Adoration, Scriptural Rosary, etc…)? Could this be the time to contact a counselor to heal an old wound that you suspect is limiting the quality of your relationships with self, others or God? Could this be the time to engage a spiritual mentor (often called, “Spiritual Direction”)? One Response to Time for an Upgrade? Loved this reflection and am grateful to learn of the podcast, “Pray as you go.” So happy to be reminded that the childish ways of faith need updating–thanks for an awesome article!